There are spoilers for the game in this review. All still photos are from my own playthrough. I’ve never liked the God of War series. There, I said it. I did play the first game and was very eh about it, although I enjoyed the fighting style even if it was basically button smashing a lot of the time. I played the second game and gave up at that point. I could never get into the hyper-masculine super aggressive and violent Kratos, who is so stoic I’d call that a smokescreen for him just being bland. Sorry. I did appreciate the visual style too, and I did think it had some interesting story aspects, but it wasn’t enough to keep me up with it. I was assured by friends who also didn’t like the series that this one was different, so I tried it out. They were right! This is different. It was a real story with impressive graphics, fun fighting, excellent voice acting, and Kratos is actually compelling in this one, go figure. Although still very stoic; the game manages to center on how there’s a lot going on under the surface thanks to some excellent facial expressions and character beats. But I’m getting ahead of myself! God of War is set right after Kratos’ wife Laufey/Faye has died (tune in for more thoughts on her later), and she requested that he and their son Atreus spread her ashes at the highest mountain peak of the nine realms. This is much more complicated than either of them realize once they set off on their journey. 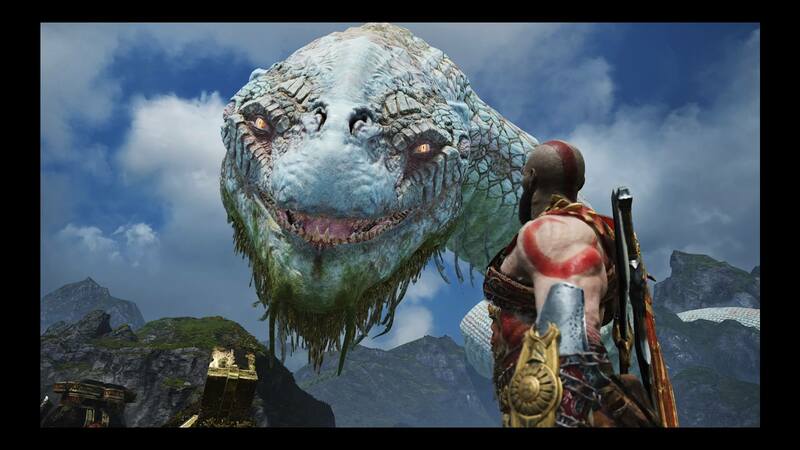 It’s been many years since Kratos was the Ghost of Sparta who slaughtered the Greek Gods, and he’s settled into Midgard, so that means we’re dealing with Norse mythology now. 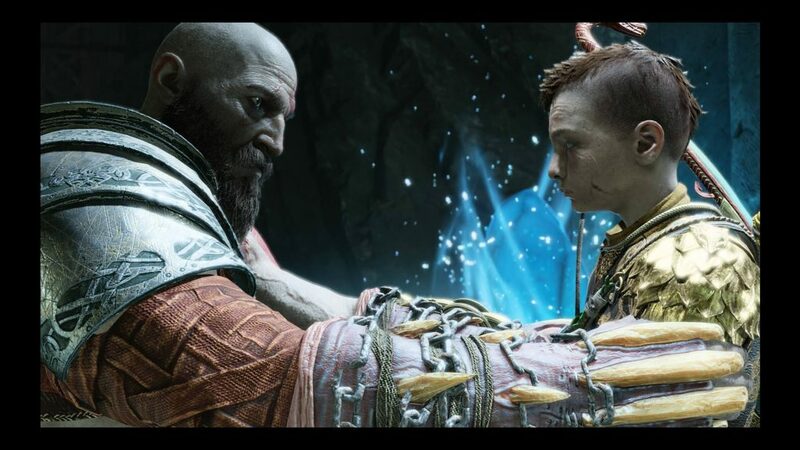 Kratos is a pillar of ice when his son Atreus attempts to connect with him and talk about his mother’s death. Kratos is approached at their house by a Norse god, who turns out to be Baldur, and they have a vicious fight. Baldur does not appear to be killable, and he feels no pain. As their journey goes, they run into a Witch who heals animals and keeps a beautiful but quiet lifestyle in a giant turtle. It’s very cool. They also meet dwarf brothers Brok and Sindri, who refuse to speak to one another but both help you upgrade your weapons and armor. They also appear to know Laufey/Faye, but reasons for that are kept quiet to start. And never fully explained although it makes some sense by the end. They helped her create her axe, which she gave to her husband. It is magical and badass and I loved throwing it at people. With the help of the Witch, they are able to eventually journey to other realms all with the intention of making to the highest peak, which was closed off by Odin. Their journey most involves needing to get to Jötunheim, the home of the giants. 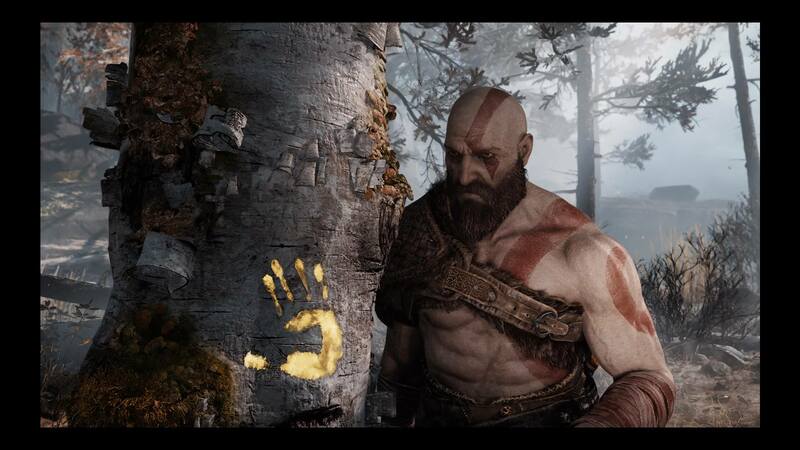 However Atreus eventually gets sick, having spent most of his childhood sick as well, and the Witch tells Kratos he must go down into the underworld to help him. This is after she is revealed to be Freya, who was banished by her husband Odin from stepping foot in certain realms because she hated that dude. Odin’s track record in mythology as a cruel SOB continues. Kratos starts seeing his ghosts, specifically Athena at first, and he gets his weapons back from his time in Sparta and reluctantly accepts that he is both that man and the new one he turned into. Atreus is ill because he was never told he was a god, and his body was trying to make sense of a god trying to be a mortal. Now that he knows the truth, he is stronger … and also more of a little brat. I get that though. He has to go through the experience of acting like an over powerful god only to go back to the kinder pensive kid he is. Anyway, long story made short, assume there are a lot of side quests, they battle gods and demigods and make it to the mountain. Also have to mention seeing the world serpent Jörmungandr is the coolest experience. Ahhhh! First Kratos has to deal with Baldur. He is Freya’s son and she tried to protect him by making him incapable of death (outside of mistletoe). This however was more of a curse as it also made him incapable of feeling anything at all. Kratos kills Baldur in order to protect Freya, but she then says she’ll never forgive him and get her revenge. It might sound unreasonable, but she was willing to die for her son if that gave him closure. It’s all complicated, but the world is better off without the man, that’s for sure. When they reach the peak, they find out that Faye was a giant herself, and that all of this had been part of a prophecy written on the walls. It is Atreus’ story actually, and this is going to no doubt be more obvious in the sequel to this. Kratos witnesses his own death on the prophecy wall but hides it from his son. And that’s it for now. I did forget to mention the head of Mímir, the smartest person in the world, comes along with you and spouts exposition and lore. I loved him though. I didn’t mind him rambling on about myths, it was great to learn about how this game approached the Asgardian stories. So that’s the story! I missed some things, but that’s because it takes hours to complete and I can’t mention everything. I really enjoyed all of the characters. The visuals are flat out stunning. There are no words really to express how beautiful this game was. Several times I would pause it just to look closely at the impressive work put into every movement on the screen. The voice acting as I mentioned was spot on, shout out the awesome Christopher Judge for putting so much power and gravitas into Kratos. Maybe that’s why his character felt stronger and more compelling. I liked the new twist on the myths. I liked the worlds we did get to see, but I assume the other realms will be open when we eventually have to fight and kill Odin and Thor. There was a feel of ‘be prepared for the sequel’ as many things were left open and implied in this one. I did roll my eyes when Atreus’ other name “Loki” was mentioned, but fine, fine, fine. I do think that what they’re possibly planing to do is to kill Kratos next game and attempt to continue the series with Atreus as the lead. It is wise to introduce him here and make us care about him and his relationship with his father. So you will hopefully be invested in his story by the end and want to stick with him. I do want to mention that I wish we got more of Laufey. I was a little sad that the game started with her being gone, so all we hear about her is other people’s accounts, and I feel she’s so major and it’s a lost opportunity that we never got to see her. 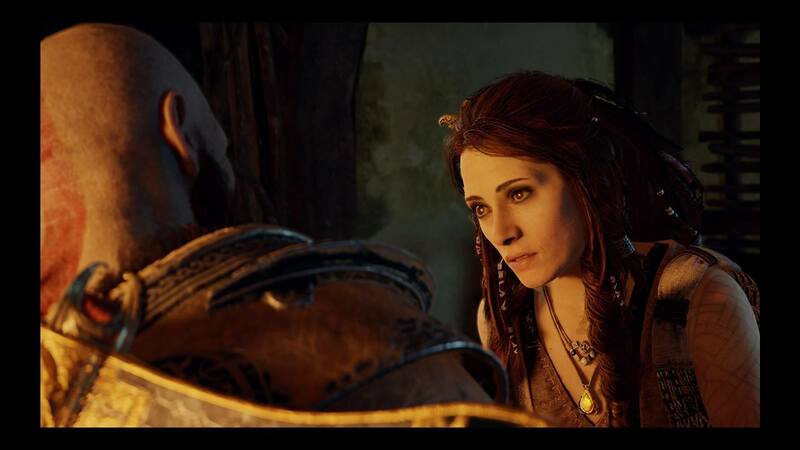 It would be very cool if we got some flashbacks to her in the next game, possibly as Atreus starts coming into his power and remembering his mother’s teachings now that he knows she was a giant. I very much enjoyed the combat and the new powers I was given as I went through the story. The mechanics were easy to learn. I do get that having it be a normal RPG in the way of skills upgrade and changing clothes and upgrading weapons can be frustrating to people who didn’t really want that as part of this game. I’m used to it, so it didn’t bug me. I loved when we were able to switch between the axe and Kratos’ weapons. Great gameplay. I enjoyed moving between the realms, although I admit I didn’t do enough of the sidequests to open up both of the extra ones, whoops. I honestly don’t know that I have a criticism about the game. It felt solid from beginning to end. I’m impressed that I enjoyed the father-son story too, since I’ll admit I’m getting kind of sick of those storylines in everything I watch and daddy issues are a little overdone. It worked here. I liked the characters, the visuals, the fighting, the sidequests I did do, the music, and the overall plot. It made me truly care about God of War and its protagonist for the first time, and that’s no easy feat. PS the dwarf brothers were my favorite. 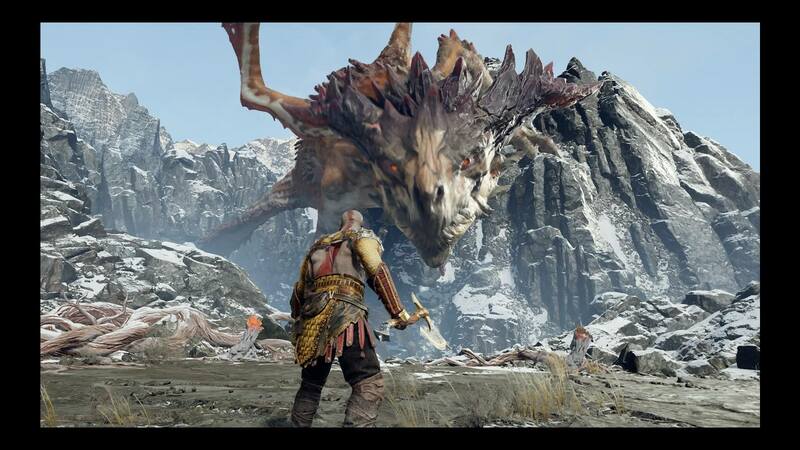 Posted in VGReview, Video Games and tagged with atreus, baldur, christopher guest, dwarves, freya, ghost of sparta, giants, god of war, kratos, loki, norse mythology, playstation, sony, video games.